God bless OUR fire fighters. Our children. | Relax, it's just Life! God bless OUR fire fighters. Our children. I drove to Whiskeytown today to see if it was still impossible to see the lake or the mountain. The park was closed. While driving there the majority of traffic on the road was fire trucks, water trucks, police, other workers, and lots of groups I didn’t recognize. These photos were taken to HONOR and THANK all the young men and women who risk their lives to save ours. It’s 106 here today. Be sure to say thank when you can! cannot believe what these guys and gals are doing. This one touched my heart. So young. So exhausted. 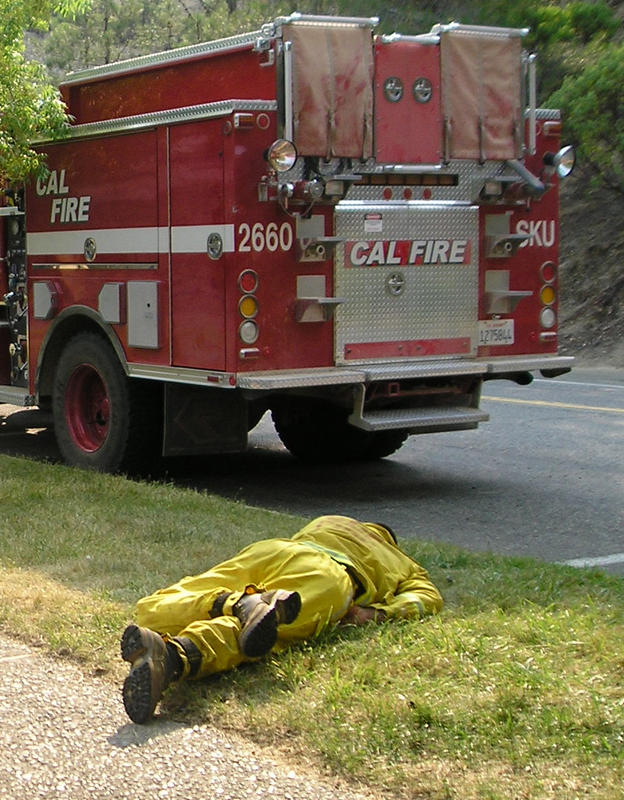 Sound asleep in full gear while the heat climbed to 106 degrees. This entry was posted on July 11, 2008 at 11:08 pm and is filed under christianity, family, friends, LIFE, Love. You can follow any responses to this entry through the RSS 2.0 feed. You can leave a response, or trackback from your own site. God Bless them ALL! They have to be exhausted in those uniforms and in that weather. Thank you for sharing.